The largest province in Canada, Quebec is located on the eastern side of the country and covers an area nearly three times the size of Texas, most of it sparsely populated. Its population is primarily French-speaking. Quebec’s geography is widely varied, from heavily wooded regions in the south to the scenic mountains along the east coast to the vast, uninhabited tundra regions in the north. The Quebec-Labrador caribou used to be Quebec’s primary big-game hunting draw, but reports of decreasing numbers of caribou recently led to the government curtailing these hunts. 2017 is the last year for nonresidents to hunt caribou in Quebec; the province has announced that there will be no caribou hunting for at least the next two years. However, Quebec still has excellent hunting for white-tailed deer, moose, black bears, waterfowl, upland birds, and small game. Moose hunting in Quebec can be a great value, especially if you can get a group of hunters together. Hunts are conducted in wooded areas far off the beaten track and are usually conducted from stands or by calling. Black bear hunting is excellent in Quebec and bears are plentiful; both spring and fall seasons are offered. Tags for both moose and bears can be purchased over the counter. Most bear hunts are conducted over bait. Bear hunts are typically morning and evening affairs and can easily be combined with fishing for pike, walleye, perch, or other species. White-tailed deer hunting can be found throughout the southern regions of the province, but the most famous destination for whitetails is Anticosti Island in eastern Quebec. Whitetails were brought to the island in the 1800s and some 200,000 deer thrive there now in the heavy forests and swampy bogs. There are several ways to hunt Anticosti, including stand hunting, still-hunting, glassing and stalking. Accommodations range from basic to luxury, and while all hunts are outfitted, you may hunt either guided or on your own. Quebec is famous for its excellent wingshooting, particularly for ducks and greater snow geese, as well as hunting for upland birds including ruffed grouse, spruce grouse, ptarmigan, and woodcock. Nonresidents of Quebec are required to hire an outfitter to hunt most big game, and fluorescent orange must be worn for rifle big-game and small-game hunting. Quebec is divided into 29 hunting and fishing zones (zone 25 is fishing-only). 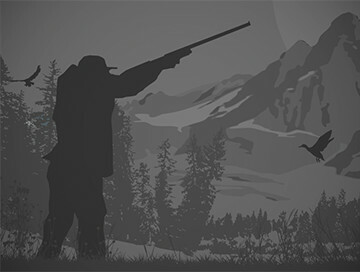 Hunters must abide by the rules of the zone they are in. 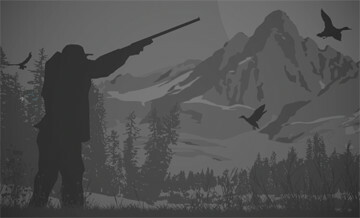 Find out more about the regulations governing hunting in Quebec at http://www.mffp.gouv.qc.ca/english/publications/online/wildlife/hunting-regulations/general-regulations/index.asp. One of the few areas where black bears are still plentiful and hardly ever disturbed! From the 2nd week of May to the end of June, 1 black bear per hunter. We are very confident that you will find our services and accommodations excellent. Plan a week hunt with us for a memorable and successful trip. Our black bear huns take place in zones 7,15 and 26 of the Quebec wildlife zone. We cover different types of habitat due to the size of the land we have. We mainly hunt on private lands, around 80% of our lands are farmlands with corn and oat fields. Black bears find there all kinds of food they need to go through the Quebec winter, we do not need to make a food plot - we have them all over.. Year to year, we have an average of 90% success. The average black bear size is around 60-80kg but some nice trophy will get over 150kg in the spring time. This semi-guided hunt is over a baited site, and all the hunters have an opportunity to hunt a bait that was never been hunt before him. All the baits are set for bow hunters with shoot under 25 yards or firearm hunters and are designed to offer the best advantages to any hunter. Also, we are offering ground blinds for the ones who cannot hunt from a tree stand - we accommodate all clients. Arrival is on Sunday and hunting is Monday through Friday.